Several collective nouns can apply to all bird species, such as flock, colony, fleet, parcel, and dissimulation. Other not-so-common flock names that can be used for any type of bird include cloud, mass, collection, or just plain group or throng. In fact, any generic name for a large group, whether it is people, animals, or birds, could be applied to a flock. 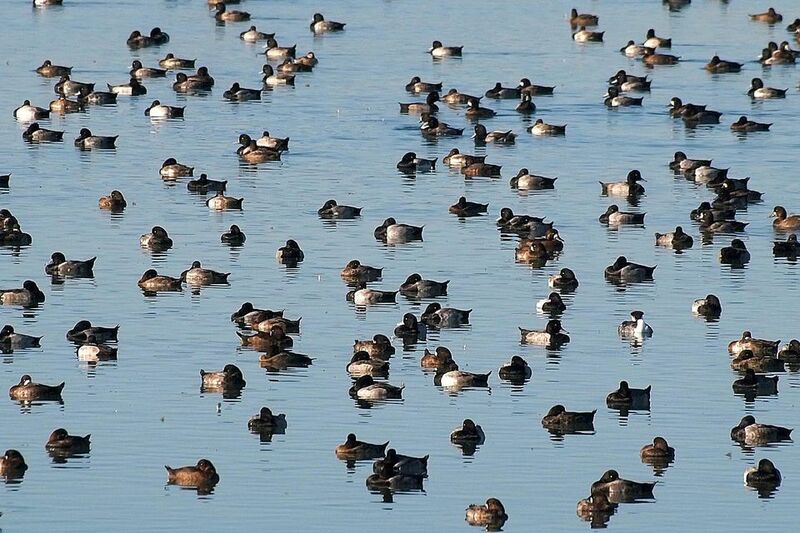 Birders, however, know there are unique and distinctive names for specific bird flocks. When Is a Flock a Flock? Numbers: Just two or three birds is not usually a flock, but there is no set minimum number of birds needed to call a group a flock. In general, larger groups are always considered flocks, while smaller groups may be flocks if the birds are not often seen in groups. For example, gregarious birds such as gulls, ducks, and starlings are often seen in very large groups, so just a half dozen of these birds together would not usually be called a flock. Less social birds, however, such as hummingbirds or grosbeaks, would be considered a flock of there were only a few birds, since they are much less likely to gather in larger groups. Species: Any large group of birds, no matter how many different species make up the group, can be called a flock if only a general flock term is used. The more unique, specialized terms, however, are only used for single-species flocks. The exception is when all the species that make up the flock are still in the same related family. A flock of sparrows, for example, can still be called a knot, flutter, host, quarrel, or crew even if several sparrow species are part of the group. A group of wading birds, however, is just a flock if there are herons, godwits, egrets, flamingos, storks, and plovers all mixed in the crowd, as all these birds have different collective nouns for their individual species. The collective nouns for different groups of birds can be a fun bit of birding lingo to use when describing what you see in the field. How many will you see?